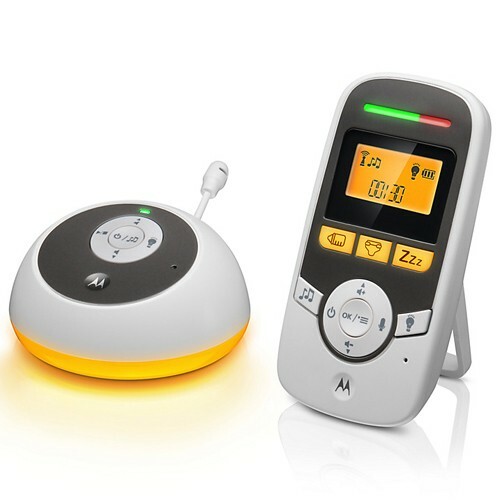 The Motorola MBP161 Timer Digital Audio Baby Monitor uses DECT interference free technology that offers a strong wireless connection, which means better range and less chance of missing something important.The two-way talk feature allows you to speak to your little one and with the high sensitivity microphone you will hear every clear sound coming from your baby’s room, so you can be there when they need you. 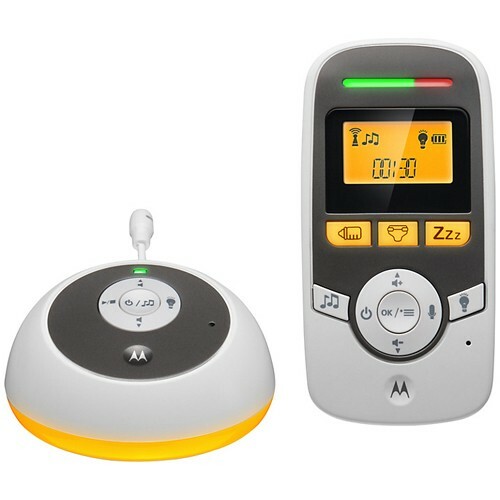 The MBP161 Timer has 3 activity timers pre-set so you can set a time when your little one needs their sleep, nappy changing or milk feeding and have an alarm alerting you. 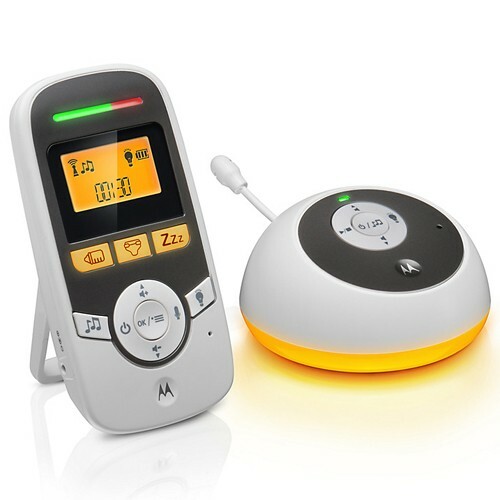 There is an integrated night light on the baby unit which will calm your baby, while the integrated lullabies help soothe your baby to sleep. You can adjust the volume of the sound to best suit your surroundings, so you can keep up with your little one. 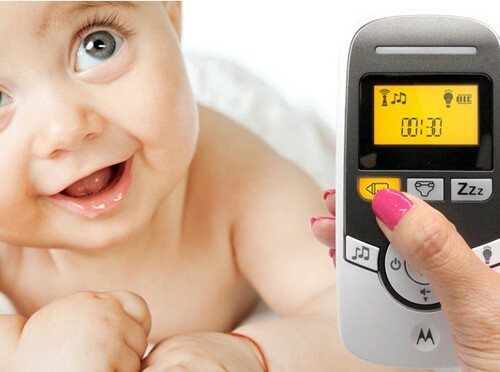 Room temperature monitoring is enabled and displayed on the parent unit, thanks to the integrated thermometer keeping you informed on the real-time temperature of your baby’s room. The LCD screen with backlit display ensures a more interactive experience for you as a parent, as it enables you to control everything from the parent unit. The long range of up to 300 metres means that you are able to take your parent unit around your home without any audio distortion.There is a sound-activated LED alert on the parent unit, so you are able to visually see the loudness of any sound emitting from your baby’s room. The belt clip on the parent unit lets you move around your home with ease. The out-of-range alert lets you stay connected with your little one as the alarm sound will give you a warning, even if you have large home. The MBP161 Timer has an integrated eco-mode so you never use too much power when plugged in to the mains. 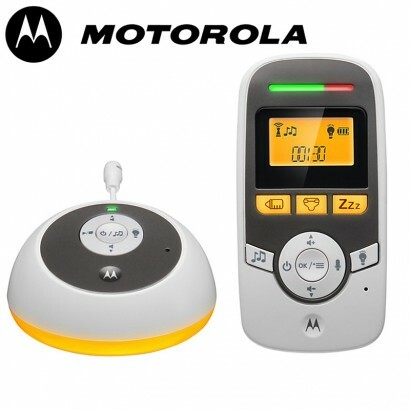 The low battery indicator lets you know whenever the parent unit is running out of power, so you can put it back on charge thanks to the rechargeable battery and continue using your monitor. The parent unit has a standby power of up to 14 hours, giving you a more flexible pattern on your usage.